Home > SHARE - IPO > Reliance Nippon Life MF Looks to Raise Rs 1,524 cr Via IPO..! Reliance Nippon Life MF Looks to Raise Rs 1,524 cr Via IPO..! Reliance Nippon Life Asset Management, India's third largest mutual fund, will raise up to Rs. 1,524 crore through an initial public offer (IPO) later this month, valuing the firm at Rs. 15,240 crore. The issue the first by a domestic mutual fund has been priced in the band of Rs. 247 to Rs. 252 per share. 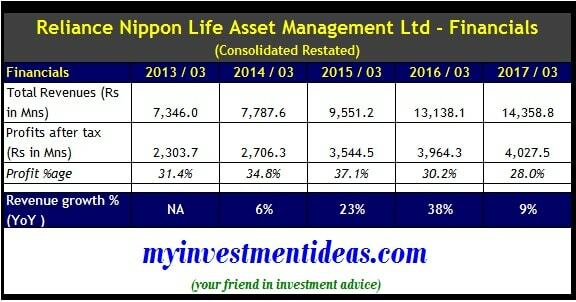 The mutual fund, jointly owned by Mr. Anil Ambani's Reliance Capital and Nippon Life Insurance Company, manages assets worth Rs. 3,80,000 crore. Of this, the average assets under management under mutual funds is Rs. 2.31 lakh crore on September 2017, while pension accounts make up the bulk of the rest. At a value of Rs. 15,240 crore, the IPO will value the fund at 4% of the total assets of Rs. 3,80,000 crore. The issue will value the firm at 6.6% of the domestic mutual fund business. Money managers said the company has a `first mover advantage' with its IPO as investors would want to bet on the shift in household savings from physical assets to financial assets. “There is a structural shift in the Indian household savings pattern.Household savings are attracted to wards equity as an asset class, and mutual funds who help channelise investor savings are one of the biggest beneficiaries,“ says Mr. Alok Ranjan, headPMS, Way2Wealth. The Indian mutual fund industry is at a nascent stage of growth with approximately 34% of the population invested in mutual funds.